Detaining migrants indefinitely violates international norms and Canada’s Charter of Rights. 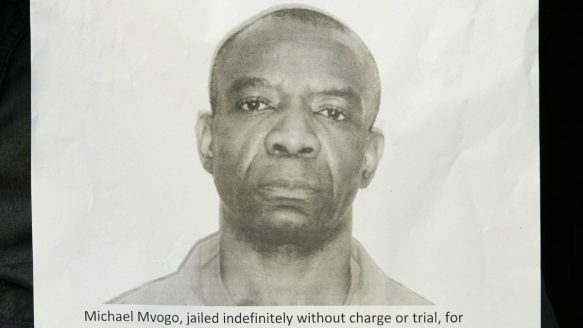 Image of Michael Mvogo taken from a photocopy. Mvogo has been held in a Canadian jail for seven years. Immigration officers can’t deport him because they can’t confirm his identity. In Canada, the maximum penalty for assault is five years in prison. Michael Mvogo, a migrant believed to be from Cameroon, has been locked up for seven years. He did not hit, hurt or beat up anyone. He arrived in Canada with a fraudulent American passport and was arrested at a Toronto homeless shelter in 2006 for possession of a small amount of cocaine. Until Ottawa can confirm his identity, he will remain in detention. Seven years in a cell is a disproportionately high price to pay for being deceitful. The maximum penalty for theft over $5,000 is 10 years imprisonment. Victor Vinnetou, believed to be a South African anti-apartheid activist, is approaching the 10-year mark. He did not steal anything. He arrived with fake travel documents and refused to provide immigration officials with enough information to establish his identity. Nine years in custody is an onerous punishment for being uncooperative with federal authorities. The maximum penalty for failing to provide a child with the basic requirements of life is two years in prison. Amin Mjasiri, who faces to deportation to Kenya/Tanzania, wouldn’t dream of depriving a child of food, shelter, clothing or love. He has stopped eating himself to protest his indefinite confinement. He aches to be with his wife and six-year-old son. None of these individuals is dangerous. None is being punished for any crime. They violated — or may have violated — Canada’s immigration regulations. On arrival, their cellphones, toiletries and other possessions are confiscated. They are closely guarded and separated from visitors by a glass partition. On any given day, approximately 600 non-citizens are in administrative detention. Two-thirds of them are in immigration holding centres in Toronto, Laval and Vancouver. The rest are in maximum-security provincial jails. An immigration officer suspects the person will go underground to avoid deportation. The officer cannot establish the identity of the individual. The officer believes the person poses a risk to the public. No proof is required. Suspicion is enough. Last year, the government detained approximately 10,000 people (including 300 children). Most were locked up for a couple of weeks — the average is 25 days — then shipped back to the countries they tried to escape. Some were released into the care of a guarantor who agreed to forfeit his or her deposit if the individual failed to show up for all scheduled immigration procedures. Ottawa says these detainees are not prisoners. But they have no freedom, no privacy and no contact with the outside world except supervised visits. Moreover, a third of them are in jails, mixed with the prison population. Canada’s Charter of Rights and Freedoms explicitly states that “everyone (not just citizens or permanent residents) has the right not to be arbitrarily detained or imprisoned.” But going to court is not an option for most detainees. They can’t afford a lawyer. A network of human rights activists called No One is Illegal has launched two constitutional challenges in the last five years. The first case ended without a ruling because the plaintiff was released. The second one was blocked by the Federal Court, which refused to grant leave to hear the case. The group is not giving up. “We hope to be moving a few more of these cases to the Federal Court in the new year, hoping that this time the public pressure will encourage the justices to actually hear the case,” said Syed Hussan. There isn’t a lot of public pressure at the moment. Since a leaky cargo ship carrying 492Tamil asylum seekers from Sri Lanka was intercepted off Canada’s west coast three years ago, attitudes in this country have hardened toward refugee claimants. Only a handful of doctors, lawyers, refugee advocates, human rights defenders and concerned citizens still speak out against arbitrary detention. More voices are needed. More Canadians need to ask whether locking up noncriminals reflects their values.